Need to fade your tattoo for new work? We've got you covered. Just Need Laser Tattoo Removal To Fade? In most cases, where partial removal or “fading” is the objective, a maximum of 1-3 treatments will be required before your artist can provide new ink you’ll be happy with. The lighter you go, the more options you have! Historically, much darker tattoos have been required to cover ink that hasn’t been faded and may lead to more regret. We recommend consulting with your tattoo artist after each session to find out if you need any further treatments. Fading for a cover up is a great option and requires far fewer treatments for you to once again be happy with your skin. Choosing to fade also makes sure the original tattoo doesn’t show through, which can be quite common in cover-ups that haven’t had laser treatment. Our medical grade technology is scar free and causes no long-term damage, allowing your skin to be safely tattooed once again. If you’re just aiming to fade your tattoo at the moment, but aren’t yet sure what you’d like to cover it with, we‘d be more than happy to put you in touch with some great Sydney artists who can talk to you about your options and recommend how much fading you’ll require. They understand the process better than anyone and want to make sure you get it right the second time round. To fade your tattoo we operate Sydney’s first Quanta Q-Plus C Evo, the only system operating all 3 wavelengths capable of removing or fading a variety of colours, while also rejuvenating the skin. We’re very proud of the results we achieve and have a number of clients who have covered their old tattoos after treatments with us, just like the one here. We’d love to help you also find happiness with a new tattoo. 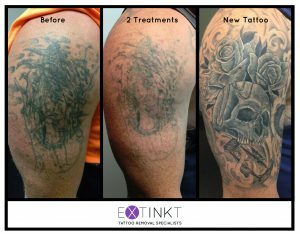 https://www.extinkttattooremoval.com.au/wp-content/uploads/2017/08/laser-tattoo-removal-sydney-extinkt-logo-300x97.jpg 0 0 Matthew Harvey https://www.extinkttattooremoval.com.au/wp-content/uploads/2017/08/laser-tattoo-removal-sydney-extinkt-logo-300x97.jpg Matthew Harvey2017-03-23 04:21:122018-10-01 23:57:14Just Need Laser Tattoo Removal To Fade?